The number of complaints and actions taken against real estate agencies and agents has fallen, likely due to factors such as enforcement and consumer education. According to the Council for Estate Agencies' (CEA) annual report released yesterday, 224 letters of advice or warnings were sent to agencies and individual agents in the year ending March 31 - less than half the 644 issued in the same period last year. 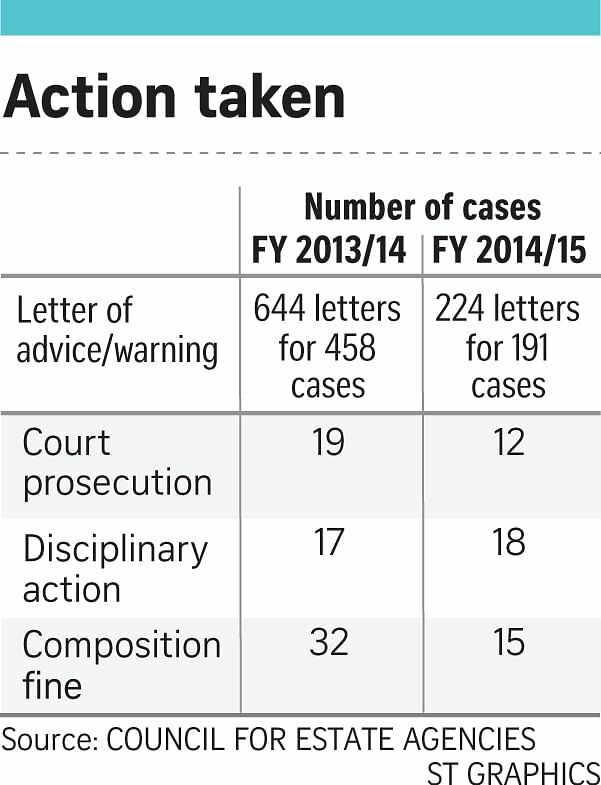 The number of cases prosecuted in court went down from 19 to 12, and composition fines issued fell from 32 to 15. Complaints, too, dipped from 751 a year ago to 702. About 43 per cent of these complaints were related to advertisements or fliers, including issues related to misleading or missing information. Unprofessional or poor service, such as giving wrong advice or tardiness, accounted for 23 per cent of the complaints. CEA deputy director for licensing Heng Whoo Kiat attributed the drop in the number of complaints to the industry watchdog's enforcement, development of salesmen and consumer education. The CEA is a statutory board, formed in 2010, under the National Development Ministry to regulate the real estate agency industry. Mr Heng said the CEA's rules, which include annual renewal requirements for agents, have "generally enhanced industry standards". Institute of Estate Agents president Jeffhery Foo agreed. "Standards are getting better and more real estate agents are toeing the line now," said Mr Foo. But he added that there is still room for improvement. "There will always be some black sheep. Some agents might be eager to close a deal and resort to bad practices," he said. PropNex Realty chief executive Mohamed Ismail Gafoor said improving industry standards was "an education in progress". He added that the drop in complaints is especially significant given that resale transactions have gone up marginally in the past year amid a cooling market. While private resale transactions during the period of the annual report dipped compared with the same period the year before, the public housing resale market saw a step-up in volume. There were 17,672 Housing Board resale applications from the second quarter of last year to the first quarter of this year, up slightly from 17,546 in the same period last year. Despite this, dampening resale prices, brought on by cooling measures, have discouraged agencies and agents from entering the sector. There were 1,422 licensed estate agencies in the year to March 31, including sole proprietors, partnerships and companies, down from 1,449 in the same period last year. The number of registered individual property agents also fell from 33,498 to 32,006. Of these, only 1,654 were new entrants, compared with 3,061 the year before. Mr Ismail said the CEA's compliance requirements - such as having to purchase a professional indemnity insurance - are useful in raising standards, but also make it tougher for some agencies to survive. His company spends more than $250,000 annually on compliance costs such as these. He said: "Smaller companies would find that it's not sustainable over time."